People have been desperately searching for fully wireless earbuds, but too often they're from Kickstarters and fly-by-night startups with - I mean this literally - unsound results. Enter the new Gear IconX earbuds. These are two wire-free earbuds from a little South Korean company you may have heard of named Samsung. It's known to deliver top phones. We're now getting our first official look at Samsung's pair of earbuds that are independent from each other, along with the Samsung Gear Fit 2 fitness tracker, in leaked photos scooped up by Sammobile. The Gear IconX resemble earplugs, but in fact do the opposite by pumping music into your ears without the hassle of dealing with tangled wires. It all sounds very promising. 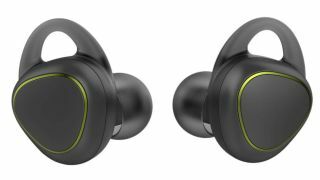 This is the clearest look we've gotten of the Samsung Gear IconX, but we've actually seen these wireless earbuds once before with rumored specs and an interesting accessory included. Expect them to work over Bluetooth, operate via touch controls, incorporate fitness tracking and pack 4GB of internal storage. That's enough for your on-the-go music playlist. Like a lot of the crowd-funded wireless earbuds, the Samsung Gear IconX appears to come with a small case that doubles as a way to inductively charge the buds. It's all in one neat package. It's like a completely wireless version of the Samsung Gear Circle from a year-and-a-half ago, and that's good news for anyone who has been looking for true wireless earbuds without luck. Official renders of the Samsung Gear Fit 2 have also leaked, and it appears that the fitness tracker will once again feature a sideways AMOLED touchscreen. It *looks* like a rerun of the Samsung Gear Fit. What's new here is that the curvy fitness band is said to include built-in GPS. That means it won't have to be annoyingly tied a phone for map-tracking runs. Equipping the Samsung Gear Fit 2 with GPS should also improve its accuracy instead of relying on a smartphone GPS chip trapped inside of your pocket or elastic armband. When can you buy the Gear IconX and Gear Fit 2? Samsung hasn't announced their existence despite outing today's photos on its own website. My bet by the end of the summer. We've seen both the wireless earbuds and fitness tracker leak twice in a week. That's a good sign for your late-summer, still-sunny-out running route. To be a more specific, August is when the company is expected to announce its next S-Pen-included phablet, the big-and-tall Samsung Galaxy Note 6.